Compare Electric Pressure Washers: Sun Joe SPX3000 or AR Blue Clean AR383? If you live in a house, you probably already know that keeping the various exterior areas clean requires a lot of work. Your deck, terraces, exterior walls, backyard, garden, fences, driveway, pool, etc. all require regular washing to get rid of not just stuck bird droppings and mud, but all sorts of dirt and grime that accumulate over time. An electric pressure washer is the tool that you can use to simplify the task of keeping the various parts of your property sparkling clean. Electric pressure washers usually consist of a motor that drives a high-pressure water pump, a high-pressure hose and a trigger-gun type switch. They plug into a normal outlet, can be supplied with tap water, and typically deliver pressure up to about 2,000 psi. Often, the water supply is connected to the unit using a garden hose. Various nozzles that control and vary the water velocity and profile can be attached to the trigger-gun. Some pressure washers also allow detergent to be introduced into the water stream, improving the cleaning process. Pressure washers are dangerous tools and should be operated with due regard to safety instructions. They should be kept away from children as water pressure near the nozzle is powerful enough to cause serious injuries. 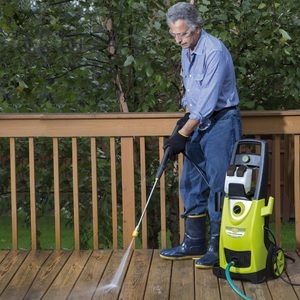 Note that if you need to take your pressure washer to areas where connectivity to an electric outlet is not possible, or if you need to reach water pressure levels above 2000 psi, you should be considering a gas-powered unit. For a comparison of two of the best and most popular gas-powered pressure washers, please click: Comparing Best Gas-Powered Pressure Washers. This article will compare Sun Joe SPX3000 and AR Blue Clean AR383 electric pressure washers. These were not just the most popular among Amazon customers at the time this article was written, but they had also received excellent reviews from most Amazon buyers (respectively an average of 4.5 stars and 4 stars out of 5 stars!). The pump of both products runs at one speed and creates a single water pressure, but you can adjust the stream's type, pressure, velocity and power by changing the nozzles or wands. Note that if you have a wide spray, the water is at low pressure. If you have a narrow spray, you have high pressure. Sun Joe lets you tailor the pressure output of the spray to your cleaning needs with 5 quick-connect spray nozzles (0º, 15º, 25º, 40º and soap) that are attached to the trigger-gun. Interchanging the nozzles allow to quickly go from a high-pressure 0° pencil point jet-spray to a low-pressure 40° fan spray, or apply detergent to the cleaning surface with the soap nozzle for additional cleaning power. AR Blue Clean comes with two spray wands that can be attached to the trigger-gun. One has a rotating spray head which can adjust the water flow from a wide spray to a very narrow powerful spray. The other is a turbo nozzle lance that is used for deep cleaning. This type of pump can develop very high pressure! It is commonly used for low-volume applications. Sun Joe includes a 34-inch extension spray wand that attaches to the trigger-gun . AR Blue Clean comes with two wands with different types of nozzles that attach to the trigger-gun. They are about 19 inches long. Sun Joe is equipped with dual detergent tanks. The removable tanks carry and store different types of detergent to simultaneously tackle different cleaning projects. A dial on the unit selects the detergent tank to be used. AR Blue Clean comes with only one detergent tank. Sun Joe is equipped with a thick "hook" that can be used to hang the rolled up cord. AR Blue Clean is equipped with a storage reel. TSS (Total Stop System) automatically shuts off the pump when the trigger-gun is not engaged to save energy and prolong pump life. This tool is used to clean the nozzles (for Sun Joe) and wand heads (for AR Blue Clean). It is inserted into the nozzle or wand head and moved back and forth until all debris are dislodged. The prices shown are the list prices in effect at the time this article was written and may have changed. For exact price information, please refer to the Amazon products section below. 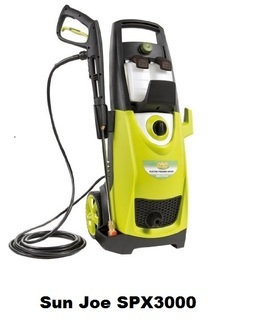 So which electric pressure washer is best to get? 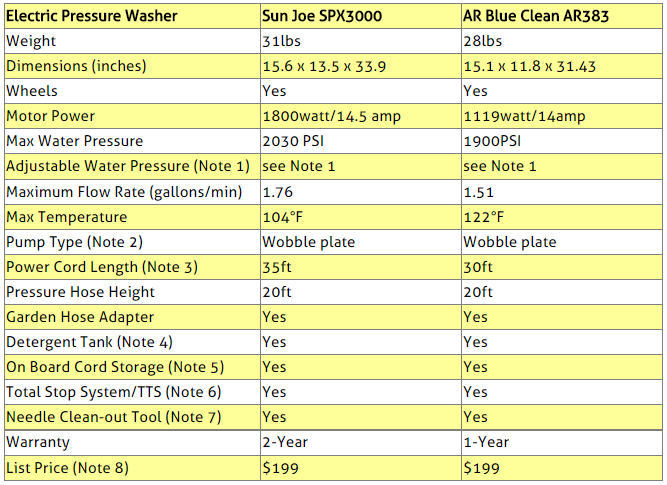 First, note that Sun Joe SPX3000 is more powerful than the AR Blue Clean. It has a stronger engine (1800watts vs. 1119 watts) and generates more water pressure (2030PSI vs. 1900PSI). With its 35ft cord and 34ft extension wand that can be attached to the trigger-gun, it provides easier access to hard-to-reach areas, such as 2 storey buildings and the underside of automotive vehicles and lawn equipment. It is equipped with dual detergent tanks to carry and store different types of detergents to simultaneously tackle different cleaning projects. A dial on the unit selects the detergent tank to be used. Finally, it has 2-Year warranty as opposed to 1-Year for AR Blue Clean. These are all important differentiators that may convince you to opt for the Sun Joe SPX3000. On the other hand, AR Blue Clean comes with two relatively long wands that attach to the trigger-gun, one of which has a rotating head that can be used to adjust water velocity and power. Some may find it easier this way of controlling water pressure as opposed to having to replace nozzles each time water pressure needs to be adjusted, as required when using the Sun Joe SPX3000. Note that the two pressure washers are priced quite similarly. Please click below the product of your choice for price information or to purchase.